Musashi Miyamoto is the literally the stuff of legend. A man, who became so skilled in the samurai arts, in combat with a sword, that not only did he found his own style of swordsmanship, still taught today, but he influenced countless generations with his philosophies and wisdom. As a student of Musashi's Mu (way) both in the art he developed - the Hyoho Niten Ichi-ryū and the his philosophy as contained in the Go Rin no Sho (Book of 5 Rings) and his other works understanding the man, separate from the myth is important. The following articles trace the facts of Musashi Miyamoto and his life as best we can determine. In these articles I reference a number of sources, translations etc - (for my notes on the difficulty of translation check this article out - here), where a great deal of information, far more that can be presented on this site, is present. Musashi Miyamoto - What's in a name. Before examining the life of Musashi Miyamoto, it's important to note that many details about his life are difficult to verify, fact often becoming very mixed with legend. Musashi does not discuss any of his famous duels in his own written account, as these writings focus solely on to the kenjutsu and heiho (hyoho / strategy). The earliest Musashi Miyamoto biography was the Niten Ki, written by Toyota Masatake, a student of Niten Ichi Ryū and published nearly one hundred years after his death. Musashi's life has passed into legend, the story of his battles and life having become the basis of innumerable movies, comic books, dubious documentaries and more. As such it is often hard to determine the actual facts. What is presented here are the more accepted accounts of his life and an attempt to give you a flavour of the man's life, the times he lived and the impetuous behind the development of- his art and fighting philosophy. In Japan, as in China and Korea, the first name follows the family name. A person with the first name "Musashi" and the family name "Miyamoto" is, therefore, correctly called "Miyamoto Musashi" rather than "Musashi Miyamoto" as we would in English. As such from here on out I will use the correct Japanese construction of Miyamoto Musashi. 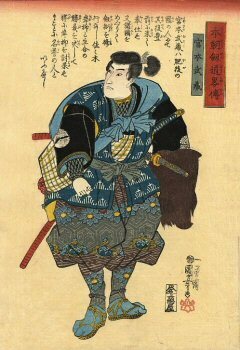 Musashi was born Shinmen Musashi no kami Fujiwara no Genshin. He later adopted the Buddhist name Niten Koji (and is often known as Niten in the art world). Most Japanese historians are of the opinion that Miyamoto Musashi was born around 1584 and died in 1646. This was a particularly interesting period of Japanese history. It began with the country in state of civil war that had raged on for nearly 100 years at this point, with the first of the 3 great unifiers of Japan Oda Nobunaga having been murdered by his lieutenant Akechi Mitsushide shortly before Musashi's birth. Musashi would live and fight in one of the greatest military campaigns of feudal Japan, the battle of Sekigahara in 1600 and several more minor battles including the Osaka campaigns and Shimabara revolt. After 1600, the landscape of war changed, the country at peace for the first time in a century. Castles were demolished and opportunities arose for the lone swordsman to test himself in individual duels and matches once again presented itself. Musashi was born in Miyamoto village, from which he takes his name. This village is located in Yoshino in Mimisaka province near Osaka. 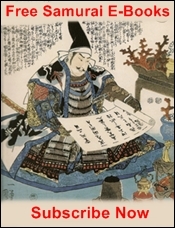 In his writings Musashi suggests that he was born in a different Miyamoto village in Ito, near the area of Harima some 50km away from his father's village after his mother Omasa was divorced from his father Shinmen Munsai, an accomplished swordsman and an expert in kenjutsu (swordmanship) and juttejutsu. Musashi came from samurai stock, as his grandfather, Hirata Shogen, was a vassal of Lord Shinmen Iga no Kami of Mimasaka Province and his family a branch of the Harima clan of Kyushu island.
" ...from youth my heart has been inclined toward the Way of strategy. My first duel was when I was thirteen; I struck down a strategist of the Shinto school, one Arima Kihei." - Miyamoto Musashi, Go Rin no Sho, Introduction. Arima Kibei was a samurai from the Tajima Province of the Shinto-Ryū Kenjutsu school. He was a wandering swordsman engaged in a musha shugyo (a training pilgrimage) where a martial artist would wander from town to town testing their skills against different schools. 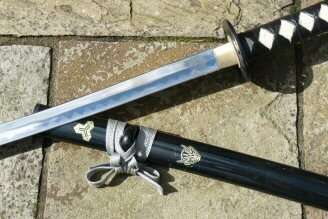 Depsite the protests of Musashi's family, as he was only a boy (though a large one - he would grow to be over 6 foot tall), Musashi was determined to compete, rushing into face Armia armed with a short sword (wakazashi) and a bō. 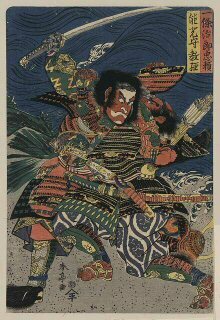 Armia blocked the first attack whereupon Musashi pressed in, rushing his opponent and knocking him to the ground. Musashi then beat him to death with the bō. 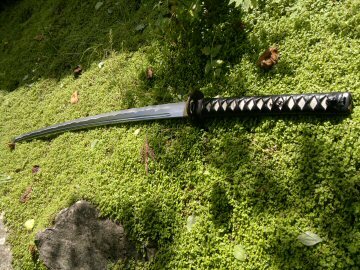 Other accounts refer to it as a bokken (wooden training sword). "When I was sixteen I struck down an able strategist, Tadashima Akiyama. When I was twenty-one I went up to the capital and met all manner of strategists, never once failing to win in many contests". 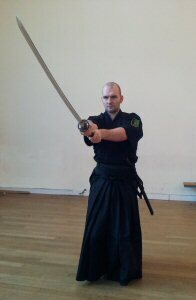 In the next part we'll explore Musashi's Duelling Years and the Formation of the Niten Ichi Ryū. You've been reading about Musashi Miyamoto. 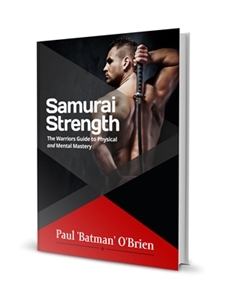 Learn more about his style of swordsmanship here. Return to the Way of the Samurai Home Page Here.